Motorcycles have always attracted 'characters' - people with the courage to live as they choose - probably because while motorcycling, the rider is vulnerable to the weather, to accidental falls, and to metal-clad traffic. It takes a little courage to ride a bike on a regular basis, so it's natural that courageous/eccentric people are attracted to motorcycling; think TE Lawrence, or for contrast, Grayson Perry. One two-wheeled character you might not have heard about is John Malcolm Thorpe Fleming Churchill, otherwise known as 'Mad Jack', for very good reasons. 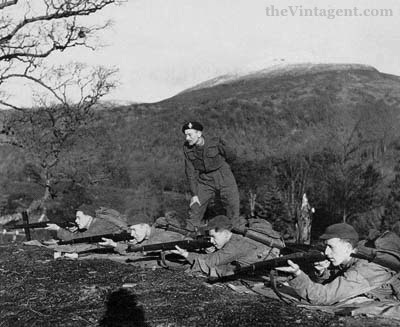 Jack Churchill training what appear to be American troops, given their equipment. Curious indeed. Jack was the sort of man who reveled in War; it was his natural habitat, the place he flourished, where he made his mark - usually with a sword, but sometimes an arrow. In the British military, where he gained the rank of Lieutenant Colonel, he was also known as 'Fighting Jack'. His lust for battle was an extension of his passion for living, and he never did anything, it seems, without giving his all. That included learning the bagpipes, and archery, and swordcraft. Churchill was born in Surrey in 1906, but was educated on the Isle of Man, at King William's College, then the Royal Military Academy at Sandhurst for University. Shortly after (1926), he joined the Manchester Regiment of the King's army, and was stationed in Burma. 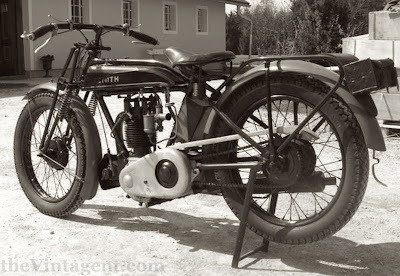 He was a keen motorcyclist, and brought his 1923 Zenith (with an OHV engine) along with him, including when sent to Poona, India, for training in Signals. Finished with his course, he decided to ride his Zenith to Calcutta, 1500 miles away over ox-cart and elephant trails, something never attempted on a motorcycle. His trip was temporarily halted when a water buffalo leaped into his tracks, so he spent a while at Indore, Central India. But he repaired the bike and completed the journey. Back in Burma, he decided to ride 500 miles from Maymyo to Rangoon via Mandalay, to 'visit friends'. 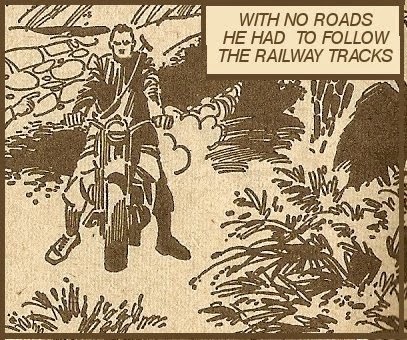 As there were no roads, he rode his Zenith on the train tracks much of the way, bumping along the sleepers, although at times across high bridges, he thought it prudent to walk the bike, and commented on the thrill of stepping between the wooden beams, with oblivion between their gaps! 'It was the bridges over the numerous kyaungs (river beds) that were a problem; there was nothing between the sleepers so I had to steer the bike by hand along the rail, while I stepped from sleeper to sleeper.' While posted at Myamyo with the Cameron Highlanders regiment, he learned to play bagpipes, and was tutored later in England by Donald Fraser, who had been pipes major at the battle of Tel-el-Kebir in Egypt, in 1882! Churchill mastered the bagpipes, as he did with most things, and was the only Englishman among 70 entrants in the Officers' Class of the Piping championships at the Aldershot Tattoo of 1938 - he placed 2nd, which was a scandal...an Englishman beating the Scots! The British and German outposts along the Maginot Line varied from 500 to 900yards apart, and each side sent reluctant patrols outside their trenches in that cold early winter of '39. Jack carried his bow on patrol, and one day found his opportunity - a German patrol was spotted in the moonlight, close enough. 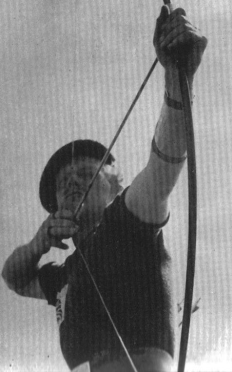 Jack stood up, and launched two arrows - 'The first I heard land with a distinct crack but there was no reaction; the second caused some commotion and a German called out, but it was most unlikely that I had hit a Hun.' The 'War Bow' wasn't the only eccentric weapon Jack carried - he also carried a Claybeg sword! 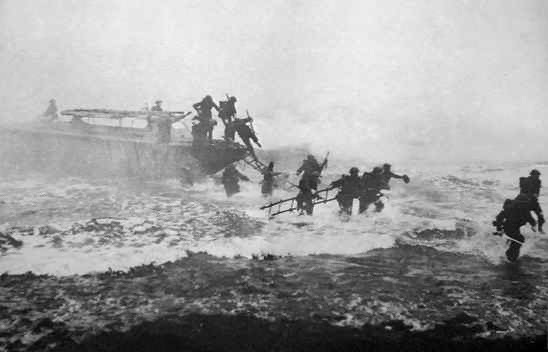 In Dec. '41, Churchill led troops of #3 Commando Unit to take the Norwegian island of Maaloy (ironically this missions was called'Operation Archery'). 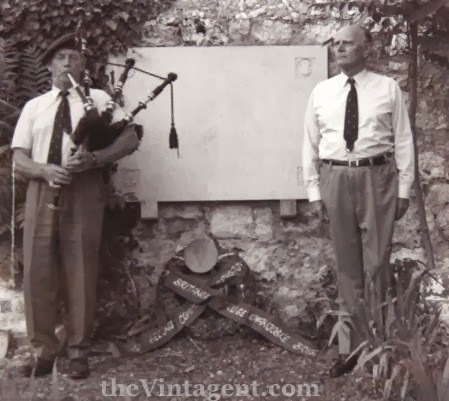 Smoke screens had been laid on the beach by British Hampden bombers, and Jack jumped ashore playing 'The March of the Cameron Men' on his pipes, sword in hand! The island, though heavily defended, was captured quickly, and when Churchill entered the German commander's hut, he found a case of champagne...and quickly opened it! While drinking his celebratory bubbly, a bomb exploded nearby, shattering the bottle, and gashing Jack's forehead. The successful raid, and Jack's bagpipe-and-sword antics, made him a popular man in the British press, but his forehead wound 'healed too quickly, in fact, and I had to touch-up my wound with Rosamund's (his wife) lipstick to keep my 'wounded hero' story going'. 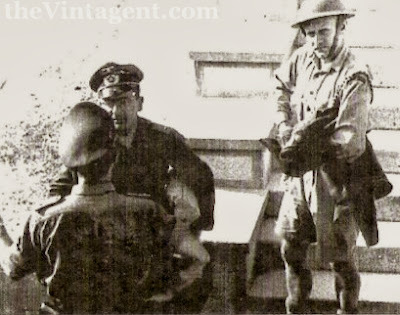 A remarkable shot of Jack Churchill the day after his capture, on June 6 1944. Jack is holding a coat from one of his four killed captains from the battle, with the blood of his 'second' ('Pops' Manners) on his arm. Wilhelm Herz is the German officer facing the camera, and sent Jack this photo in 1969. They met again in 1979 at a reunion rally of the 118 Jäger Division in Austria! 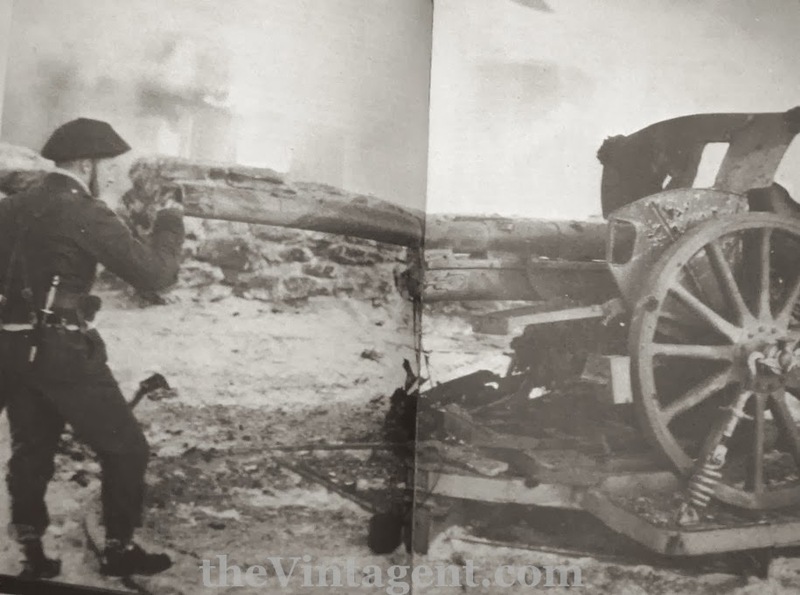 Churchill's further adventures in WW2 were legion, including a 1943 escapade, taking an Italian village near Salerno, defended by 42 German soldiers, with a single back-up man, using only his sword! He was captured in June 1944, after a failed assault on the island of Brac on the Dalmatian coast, and sent straight to Berlin, as the Germans were convinced he was a relative of Winston Churchill! 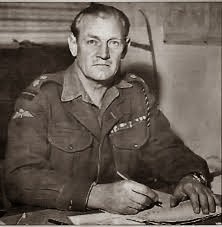 In April 1945 he managed to walk in darkness out of a work detail in Niedersdorf, Austria, and walked across the Alps at Brenner Pass, and managed to convince a passing American tank convoy that the ragged, hungry, and filthy creature he had become was a British officer. After the War, Jack, in common with many ex-soldiers, sought excitement once again in motorcycling, when he returned to Stirling, in Scotland. His mount of choice? 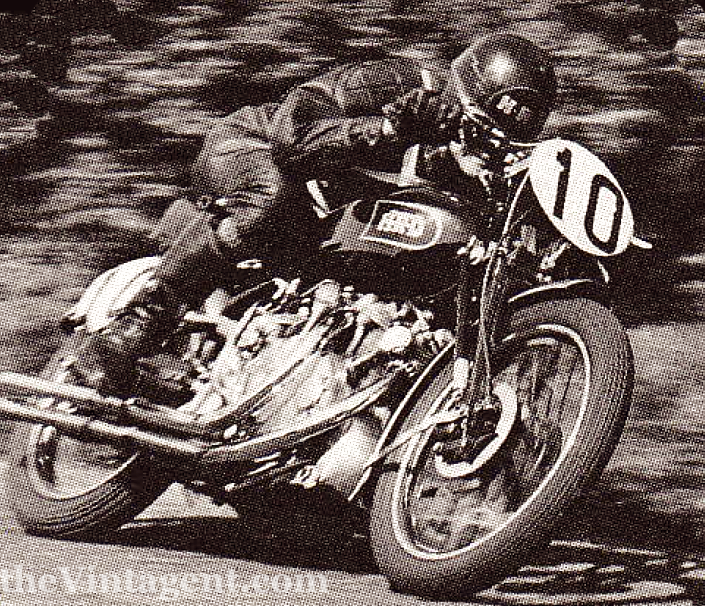 The fastest road-legal motorcycle available, and once which had proved itself in battle; the ex-Alex Phillips, 1950 Isle of Man Clubman's TT winner, Vincent Rapide. After winning the Clubman's TT, Phillips was riding the very same machine back home to Scotland, with his wife on the back! Unfortunately, they were broadsided by a truck at Ormskirk, and both were badly injured. Phillips spent 5 months in hospital, and the Vincent went back to the factory for repairs. It was re-built to full Black Lightning spec, an it took nearly a year for Phillips to collect it, taking the train from Scotland so he could ride the Vincent home. On the 500-mile journey, he found it performed 'like a rocketship', but he'd been out of work nearly a year, and put the machine up for sale shortly after. The 'most enthusiastic' response (of course!) was from Lt-Col. Jack Churchill, who purchased the machine, and must have reveled in having what was very likely the fastest road bike in the world, period. Churchill was famous for plenty of other adventures...like surfing. He was in fact the first man to surf the English Channel back in the 1950s. Jack's entire life reads like a 'Boy's Own' adventure story...and is worth investigating.